Discover Baños during your price guaranteed Ecuador vacation. All of our Ecuador vacation packages have daily departures and are fully customizable. Nestled between the Rio Pastaza and the active Tungurahua volcanoes, Baños bursts at the seams with hotels, restaurants, spas, and countless other activities in and outside of town. It is truly a perfect place, for both Ecuadoreans and travelers, to escape the Andean chill in a sub-tropical climate. Baños is, without a doubt, a must-see on your Ecuador vacation, especially for nature lovers who will revel in the numerous activities that the small town and its surroundings offer. The proximity to the active Volcano Tungurahua, which means “throat of fire” in the native Quechua language, and the numerous waterfalls provide adventurous travelers with countless opportunities for hiking, climbing, cycling, and rafting during their Ecuador vacation. After a busy day of exploring, weary travelers can relax their tired muscles by soaking in one of the natural hot springs under an Andean sky filled with stars, before heading out to enjoy the exciting rocking nightlife of Baños. Stroll down Calle Eloy Alfaro at night and you will find a string of bars, clubs, discos, and peñas, where travelers and locals enjoy the warm nights of Baños. 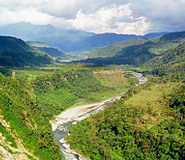 Baños city tour. 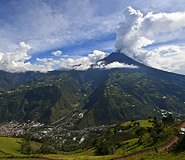 There is no shortage of amazing things to see and explore in Baños. One of your first stops should be the Manto de la Virgen waterfall, a true symbol of Baños located at the southeast end of town. Nearby is the famous Nuestra Señora del Agua Santa (Church of the Virgin of the Holy Water), a magnificent basilica that attracts countless visitors year-round. Waterfalls. In Baños you will find more than 60 waterfalls. The most popular are: Inés María, Pailón del Diablo, Manto de la Novia, Cabellera de la Virgen, San Jorge, San Pedro, Chamana, Machay, Agoyán, El Fantasma, El Placer, San Francisco, Cashaurco, and El Corazón. Most of these falls can be explored independently by either hiking, or taking a regional bus, taxi, chiva-bus, or bike. After you become acquainted with the town of Baños, explore the route of waterfalls, La Ruta de las Cascadas. This scenic route is one of the most spectacular roads in Ecuador and meanders through green peaks and some 20 waterfalls, making it a must-see on your Ecuador vacation. Thermal baths. To unwind after a long day of sightseeing and hiking around Baños, stop at the open air Baños de la Virgen pools and enjoy instant relaxation in the natural hot springs. There are pools of varying temperatures ranging from cool to extremely hot. Make sure to go up to the highest pool overlooking the waterfall for a truly magical experience. Sports. Baños is not only known as a great place for relaxation but also for its numerous sporting activities. Pretty much anything you could wish to do is available here: canyoning, climbing, trekking, cycling, horseback riding, and river rafting are only a few of the options. For the more adventurous, try puente-ing, which is a bungee-jumping-like activity from the bridges around Baños. 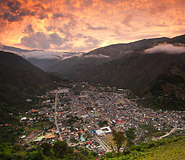 Baños is known for its almost perfect year-round climate. Travelers will enjoy the warm sub-tropical climate in all seasons. Numerous festivities take place in Baños that provide a unique glimpse into Ecuadorian culture. February: Carnival in Ecuador is celebrated with traditional water fights and festivities before the beginning of Lent in the Catholic calendar. It is a time of parades, masks, water, music, and dancing. In Ecuador, they add espuma, foam that is sprayed on everyone and everything! Easter: Celebration of the Holy Week (Semana Santa) with many processions and religious events. October: Every year, Baños celebrates the Virgin with impressive daily processions, bands, fireworks, sporting events, and partying throughout the month. Second week of December: To celebrate the anniversary of the town's foundation, countless parades, fairs, sports, and cultural events are organized throughout the week. The night of December 15th is Verbenas, when each barrio, or neighborhood, hires a band and throws parties in the streets of Baños. We had a fabulous trip to Ecuador and Peru. The Galapagos Islands and Machu Picchu were definitely the highlights. Amazing!!! Thanks for coordinating the trip. We indeed had a wonderful time. Everything went according to plan without a hitch. Galapagos trip also went without any problem. Very efficient and courteous staff. We would like to thank you for your efforts. Located within the Sangay National Park, declared a World Heritage site in 1983, Luna Runtun offers 30 comfortable and spacious rooms with spectacular views of the active Tungurahua Volcano and the city of Baños. All rooms are tastefully decorated in a chic contemporary style and equipped with exquisite modern amenities. The pools and Jacuzzi are perched upon a cliff, providing equally impressive views of the valley and grounds below. Be sure to book a treatment at the spa and taste the delicious dishes at the hotel´s restaurant while soaking up the impressive surroundings. The Sangay Hotel is located next to an impressive 262 ft (80 meter) waterfall, and is just across the street from the most famous thermal baths in Baños. You can take a dip in its outdoor pool or relax in the day spa or sauna. For the more active travelers, there is a game room available to play table tennis, pool and squash. A delectable breakfast is included, and be sure to try Sangay’s restaurant for a gourmet spin on regional cuisine. All rooms are simple but comfortable, providing a peaceful place to rest after a long day of sightseeing. This European-managed hotel provides everything to make their guests feel right at home. The rooms are large and adorned with local ceramics, masks, and paintings, and most have private balconies offering breathtaking views of the outskirts of Baños. Isla De Baños provides a variety of services and is conveniently located just next to the hot springs and a short walk from Baños' charming center.